Mass Edit your price book entries in Salesforce the easy way - A guide to success! 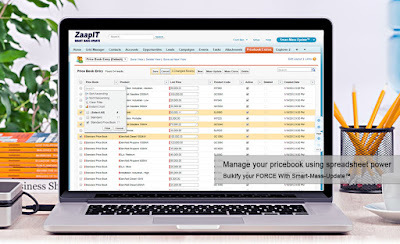 You spent days in creating your Salesforce price book entries by visiting each entry / product one by one or by creating a few CSVs files and uploading them to Salesforce via Salesforce's data loader (Enterprise Edition+) . But now you need to update the prices (& other information) instead of doing that yourself by visiting each record one by one or instead of uploading a new CSV file and try to avoid duplicates / creating deprecated products again all you need to do is to install the Smart-Mass-Update™ app from ZaapIT and create a new price-book-entries tab (via the grid manager) and you are good go. The new Smart tab will enable you to mass-inline-edit & mass-edit your data with ease. Get Smart-Mass-Update™ / Smart-Tables Now! Bulk Update - End of Quarter is BACK! Is there an easy way to Mass Update Opportunity stage & close date in bulk? It is end of quarter again and you have a lot of open opportunities you need to close or transfer to the next quarter / year. What is the best & easiest way to update those opportunities in bulk? Update Multiple fields in bulk: let's assume that you have created a view/grid with all the open opportunities ending in the current quarter, updating the opportunity-close-date or the opportunity-stage via a single-field-mass-update tool will remove the updated rows from the current view and won't give you the chance to update the second field, this behavior will enforce you to create multiple views in order to cover all the angels! Bulk update unlimited number of rows: mass update 50/100 rows at the time is better then updating the rows manually but it tends to be very frustrating. A great mass-update tool must respect the search & filters when you do a mass-update for all rows. Mass inline edit: every mass-update tool that respect your time & clicks must have a mass inline edit mode. The mass inline edit mode presents your data / records in a spreadsheet like mode which enables you to do quick refinements on multiple rows at once and then enables you to the save all your changes in a single click. A great tool will also have search & replace option similar to excel, this kind of feature could be a very handy feature e.g. replace only the year or month for a close-datefield. Mass Delete: every mass-update tool that allow you to create records in bulk must allow you to mass delete those records i.e. allow you undo your changes. A great tool will even move those deleted record to the recycle bin. Search, Sorts, Filters & Views: the ability to create your own custom "report like" views with custom filters, sorting & fields is very important - this kind of features will allow you to continue your work tomorrow / next week / after the holidays. Export / Save your data as a file: The ability to export the current records & save them as a file is a very valuable feature i.e. in case you would like to compare the before & after (of bulk update) or even to undo your changes e.g. in case you / someone else changed their mind. 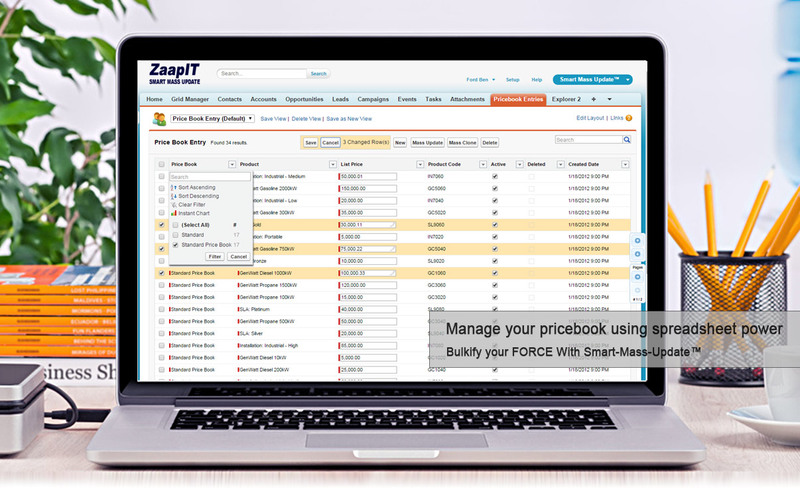 The tool I'm using in my Salesforce is Smart-Mass-Update™ by ZaapIT.com - it has all the above features and much more. 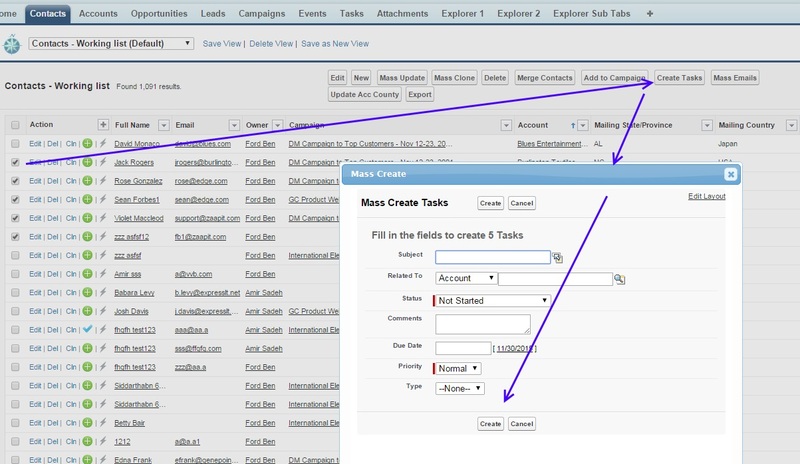 The below video illustrate how to create tasks in bulk for the selected contacts with an option to refine / control the result (via a preview page). 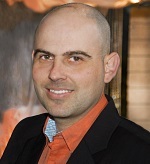 Get Smart-Tables / Smart-Mass-Update™ Now!